Driving is so much better with music on. And so much easier with GPS! Luckily for us, we can get them both (and much more) if we install the best double din head unit on our car. The only problem is to find it! Definitely not an easy job. Thats why we've created this list of Best Car Double Din Head Units. Lots of AV input and output options. What are Double DIN Head Units? The following five units I'll review here are the very best you can find on the market this year. If you still feel you haven't found something that checks all your boxes after reading this section, please refer to the navigation bar on the right hand side where you'll find more recommendations based on the particular needs you may have (like built-in navigator, best pairing with Apple products, best pairing with Android or best options for the money). 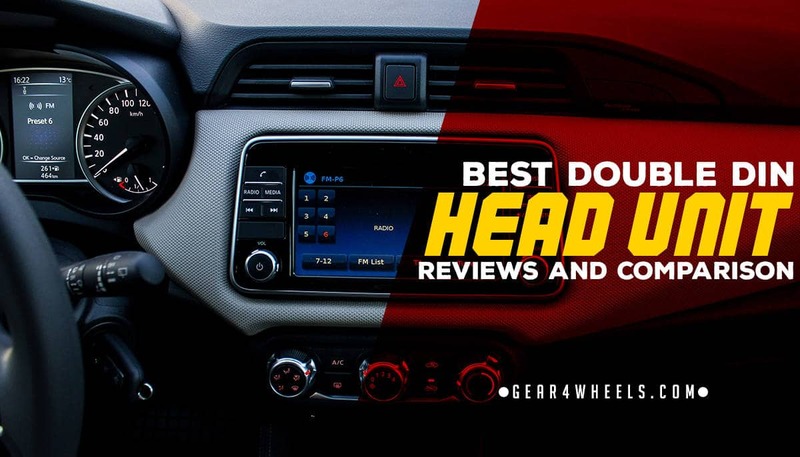 ​Below is a list of the best double din stereos that include features such as navigation, reversing cameras and much more. AVIC Pioneer headunits are Pioneer’s flagship line of car stereo head units with built-in navigation GPS modules and full smartphone integration. They pulled out all the stops for this model, including and HD radio tuner, HDMI in/out, speaker and subwoofer pre-amp outs, and a gorgeous 7” capacitive touch screen interface for watching DVDs or USB storage HD video. In terms of built-in features and expandability for a fully loaded car audio/video system, it simply doesn’t get much better than the AVIC-8200NEX. This is in my opinion the best double din head unit with built-in navigator you can buy in 2018. Let’s take a look at what is so great about this double-DIN headunit, as well as one or two minor issues that may require particular attention should you decide to invest in this excellent car stereo. First of all, the overall interface for the touch screen is absolutely top notch in terms of design and ease of use. Even better, with an additional adapter for your make and model car, you can even integrate your existing steering wheel volume and navigation controls so that you can operate both your audio track controls and voice command features without taking your hands off the 10 and 2. I know for myself that’s an exceptionally important feature to have on long road trips and during the busy daily commute while navigating through traffic. The hand held remote control is also a nice feature for when you want to show off your car stereo setup at shows or if you just want to be able to change tracks quickly and easily when working in or around your car. iPhone user? Android lover? No problem for this head unit. Both Android Auto and Apple CarPlay are fully compatible with this device. Apps like Spotify, Pandora, and similar music streaming or audio capabilities are fully integrated and ready to use from the moment you connect your device via USB or Bluetooth. Additionally the built in iPod, iPhone, and iPad controls allow you to operate your device safely while on the road, and Siri Eyes-Free control is available with all models of iPhone 4s and newere. Turn-by-turn voice prompt navigation with preinstalled US, Canada, and Puerto Rico maps can be updated via USB flash drive, and the accuracy and ease of use for the GPS system is unparallelled. Add to that free traffic updates in major cities, lane guidance, enhanced junction views (my personal favorite if I am travelling somewhere I’ve never been before), speed limit warnings, and 3D representations of select buildings and major landmarks all make this a standout performing GPS navigation system in every way. If you’re looking for a premium audio and video experience, the AVIC-8200NEX has you covered. CDs, DVDs and USB drives are all ready for video and audio playback right out of the box, and a 13-band graphic EQ makes tuning in your perfect setup fast and easy. You can even install an optional mic-adapter and use the automatic EQ system that adapts your sound to the acoustics and speakers of your car. Furthermore, Pioneer’s Advanced Sound Retriever provides the best audio quality possible from your compressed digital files, and audio playback of lossless FLAC files (up to 192kHz/24-bit) from a USB source allows you to experience the highest possible audio quality on the go. 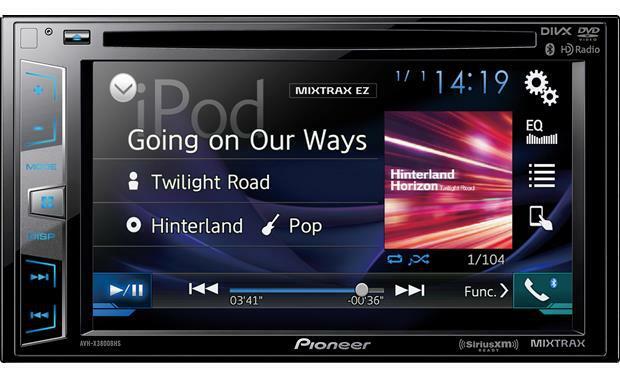 Finally, Pioneer MIXTRAX technology is pre-integrated into this head unit, allowing for continuous mixes and automated digital effects on the fly. Also, Dual Zone A/V out lets you send video and audio signal to headrest TFT LED/LCD displays should you have a desire to install them. Big fan of SiriusXM radio? Add the SXV300 Tuner for TuneMix, Traffic & Weather Now, and Sports Flash wherever you go. The AVIC-8200NEX also features an HDMI input, dual rear USB inputs, 2 rear A/V inputs, and two camera inputs for reverse camera and dash cam integration. While the AVIC-8200NEX has quite a lot to love about it, there are also a few caveats that are worth noting about a few aspects of this head unit. The internal amplification of this model is fairly weak, and installing a speaker amplifier is highly recommended if you intend to get the most out of your investment. You will need to use a 2GB or higher capacity USB flash drive to update the firmware on this model as soon as you get it since there have been numerous updates and bug fixes affecting both CarPlay and Android Auto since this unit was initially launched. All necessary files are available for free via the Support page of Pioneer’s website, and the update process is largely automated. Just make sure you update that firmware right away after installation to avoid any frustration or connectivity issues when you first start using your AVIC-8200NEX. Some users are, shall we say, less than fond of the integrated GPS voice directions? Also, you will want to update the maps modules ASAP after installation in order to give yourself the best possible turn-by-turn navigation experience possible. We keep coming back to firmware and software updates, and one of the reasons this is so important is that USB file reading and smartphone USB audio streaming have been vastly improved with the newest 1.14 version of the head unit’s firmware that launched in January of 2017. Make sure you update right away to prevent issues with your new stereo head unit. There are a wide array of expandable modules you can connect to this head unit to improve its overall functionality. The problem is they are somewhat costly to add, and they require you to pull, plug, and run cables extensively, especially for the reverse and dashcam connections. If you are an experienced car audio hobbyist, these kinds of installations will probably leave you unphased, but if you are a novice and aren’t sure what you’re doing you may find that you have bitten off more than you can chew. Internal amplifier is less than robust, so separate speaker and subwoofer amp installations are highly recommended. 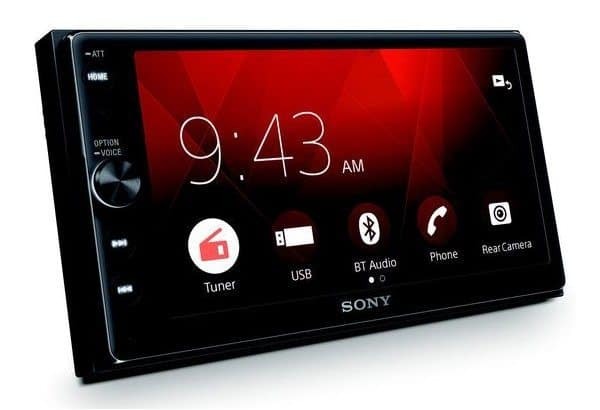 A more austere but effective offering, Sony’s XAV-AX100 is the best offering for iPhone fans who are interested in seamless Apple CarPlay integration. 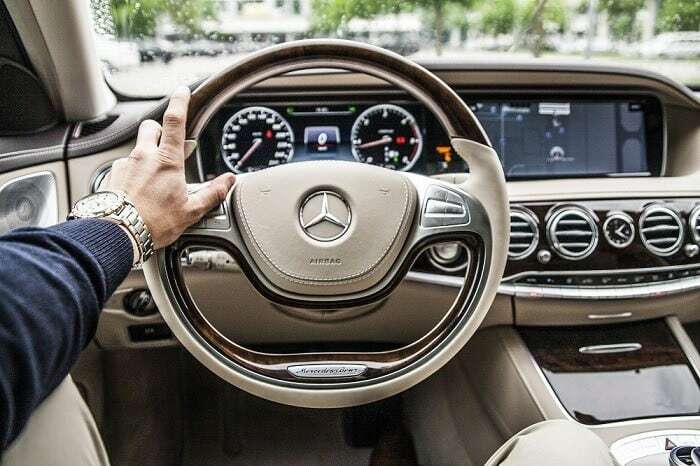 As an all digital multimedia head unit, this device does not play CDs or DVDs, but is instead intended to be a smartphone integration-driven media player. It features a 6.4” LCD touchscreen display, and Bluetooth audio streaming and hands-free calling with included external mic. With its single USB input, you can connect your iPhone or Android device for Apple CarPlay or Android Auto use. Both are fairly bug free in their operation, however Sony’s overall design does seem to favor iOS over Android in terms of visual design and menu management. Siri Eyes Free capability is also available for iPhone users. The internal amplifier pushes 17-watts RMS/55-watts peak on four channels, so it can adequately power most factory car speakers. It also has integrated high- and low-pass filters for better subwoofer, full range, and tweeter configuration, and the 10 band EQ is loaded with presets for just about any conceivable genre of music. No satellite radio or GPS navigation module add ons here, but the rear USB port and reverse camera input make it easy to add a few choice upgrades. The XAV-AX100 also has a 5-channel preamp out for running a powered subwoofer kit or a speaker amplifier for high end component speaker kits. The lack of DVD/CD support may be a dealbreaker for some, though personally I only ever use my smartphone for music and entertainment in the car anymore. Apple Carplay is truly seamless on this unit, however Android Auto is a little bit behind the power curve in many regards and may seem slower to respond. It’s possible that this may change with future firmware updates, but only time will tell on that. This is definitely and audio focused double-DIN headunit despite the multimedia description on the box. Also, if you are going to upgrade your car with some aftermarket speakers, definitely install a good speaker amp and a powered subwoofer kit. The lack of satellite radio integration and GPS navigation upgrade options may be offputting to some, but if you are looking for a great head unit that lets you use your iPhone for controlling and providing primary functions this is a good first choice. 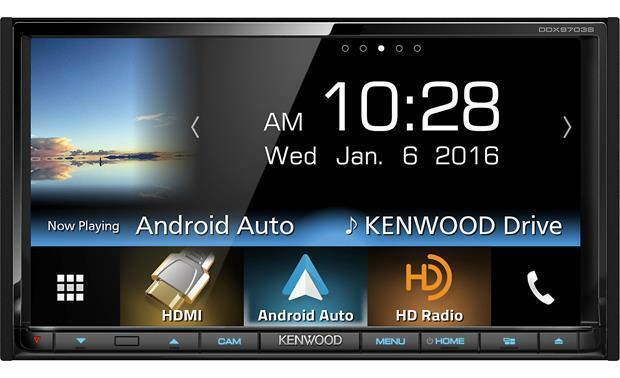 In terms of the best possible Android Auto integration, Kenwood definitely comes out miles ahead of the competition with the the DDX9703S. Let’s take a look at what makes this such a great double-DIN headunit for Android mobile device users. The large 6.95” clear resistive touchscreen display makes DVD and CD playback crystal clear, and with a motorized 7-step tilt angle display adjustment capability you can enjoy onboard A/V entertainment comfortably regardless of where you are seated. It also allows for playback of most multimedia file formats including lossless FLAC files. One feature that really sets this model apart though is the ability to mirror your smartphone display right on the head unit for select iPhone and Android devices. A 13 band EQ with Drive EQ to improve your sound while your car is at speed is included right out of the box, and DSP self-configures with its own digital time alignment. High and low pass filters also allow for selective crossover point configuration, and there are features pre installed for a reverse camera such as parking grid lines. Unit comes ready to integrate a satellite radio tuner and reverse camera, but both are sold separately. Additionally, there is a rear USB input, and HDMI/MHL digital A/V in, rear analog A/V input,and both front and rear-view camera ports. Furthermore, this unit has RCA video and audio outputs as well was its 6-channel preamp out connections for connections to speaker and subwoofer amplifiers. Reflexive touchscreens never seem to work as well as their captive counterparts, and if you are used to using a capacitive screen this may present something of a learning curve. This head unit's design heavily favors Android Auto over Apple Carplay capabilities. Internal amplification is weak. Get a speaker amp and possibly add a subwoofer kit to kick your sound up a notch. Satellite radio and reverse camera kits sold separate. 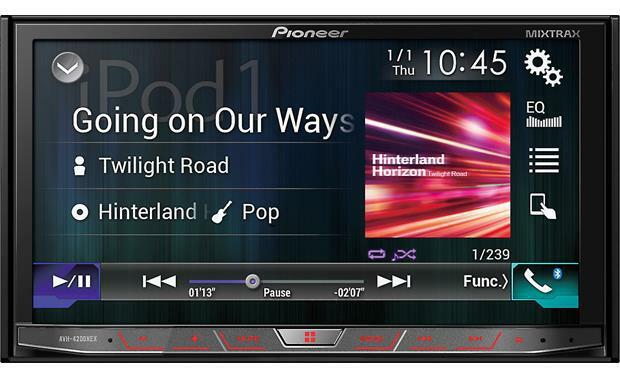 Our next stereo is another winner from Pioneer, the AVH﻿-﻿4﻿2﻿00NEX. What sets this model apart from the other Pioneer stereos on this list is the size of the device. While most Double DIN Units have a 6.2-inch screen, this particular model has a full seven-inch display. What this means is that everything is much easier to read and the menu navigation is second to none. Also, this stereo comes with a remote control so your passengers can make selections without having to get in the way of the driver. As far as functionality goes, this stereo has it all. First, you have a DVD/CD system that allows you to play movies for your passengers during long trips. If you still have any CDs, you can listen to them with crystal clarity with this stereo. Additionally, the AVH has phone sync capabilities, which means that if you have an iPhone or Android device you can connect it and use your apps without having to hold your phone. What makes it even more amazing is the fact that it has screen mirroring. This means that you can read texts and see images from your phone on a larger display, thus making it safer for use while driving. Along with the sync feature, you can connect to your phone through traditional Bluetooth, which is ideal for hands-free calling. Finally, the other thing that makes this stereo so incredible is that it comes with three preamps, so if you’re in the market for a full sound system upgrade, you can make it happen with this device. It counts with a pre-amp signal for a subwoofer (that you can connect to a monoblock amp) and two RCA outputs to power your other amplifiers, be it a f﻿﻿our c﻿﻿hannel or a five channel amp. The video below (courtesy of 5Star Car Stereo) will walk you through every single connector, input, output, controller and overall configurations you can do on the AVH-4200NEX. Check it out if you're interested on this model! DVD/CD player with a decen internal amp power and 6.2” touchscreen make for a versatile head unit that is ideal for those interested in making this the nerve center of their car audio set up. It also includes a wireless remote for easier operation at car shows or working around the garage. Bluetooth connectivity for hands-free calling and audio streaming and USB connectivity make this a good fit for iPhone or Android users, and AppRadio One compatiblity makes it easy to stream audio via USB seamlessly from your iPhone or Android device. In addition to DVD/CD player capability, this unit can also play lossless FLAC audio files via USB connection to a flashdrive or stored on your phone. A 13-band EQ with 7 presets, a 3-way network mode for the preamp, high and low pass filters, Pioneer’s Advanced Sound Retriever, digital time alignment, and Auto-EQ with the optional mic installed all make this an excellent stereo head unit for your car’s premium audio suite. Given the number of preamp out options, this model also makes it easy to connect to more powerful external audio drivers like powered subwoofer kits or speaker kit amplifiers. Add SiriusXM satellite radio and/or GPS navigation module at an additional cost. Touchscreen is reflexive, which is not as sensitive or accurate as capacitive touchscreens. Weak internal amp means you will need to add a car amplifier and possibly a subwoofer kit if you are integrating aftermarket speakers into your setup. Paid-add on modules for GPS and satellite may be something of a deal breaker if you are looking for the head-unit that does it all right out of the box. 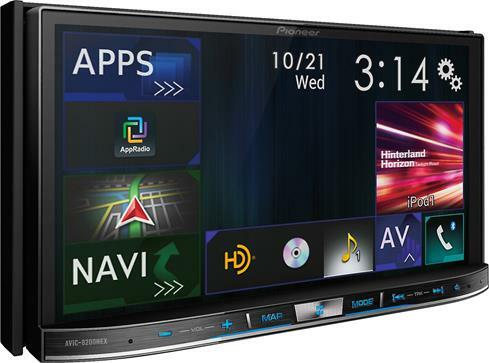 For more choices, read our Guide To Double Din Head Units with Navigator here. When it comes to listening to tunes in your car, you may or may not be thinking about the device you use: your stereo. Most of us fiddle with our car radios without ever paying attention to how it works or what we can do to replace it if we wanted to. However, for those of us who do pay attention, there is an important distinction that you should know about. When looking at different stereos, there are two primary sizes from which you can choose. You can have a single DIN or double DIN head unit. So what’s the difference? Is one better than the other? Are they interchangeable? To get a better understanding of this issue, let’s break it down. The term DIN refers to the Deutsches ﻿﻿﻿﻿﻿﻿﻿Institut für Normung, which is a German based standards organization that made these distinctions originally. Since then, everyone uses the standard DIN sizing chart for car stereos. But what difference is there between a single and a double unit? It’s all a matter of size. A single (standard) DIN Head Unit measures exactly seven inches wide by two inches tall. A Double Unit is twice as tall, so it measures seven inches by four inches. What’s important to note is that the size comparison means that you can always trade down from a Double Unit to a Single, but you cannot trade up to a Double as it won’t fit. Thus, if your car comes with a Double DIN, you can choose to swap it out for another double or change to a single model. So, if the Double DIN is bigger, does that mean that it’s better? Realistically, it doesn’t. Size does matter, but it doesn’t necessarily make the sound better. What it does provide, however, is more room for added features like a touch screen or a built-in amplifier. Single DIN Units can still crank out the best sound, but you do have more options with a Double model. Here are some of the top benefits of getting a Double DIN. 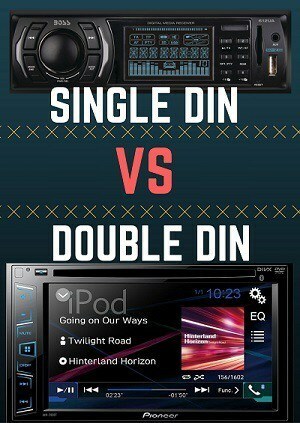 Simply put, having a Single DIN means that you cannot enjoy having a screen in your car. If you want any high-tech options such as GPS/Navigation, DVD playing capabilities, or just a menu screen that allows you to control everything in your car, a Double DIN gives you that ability. These days, because tech integration is so popular in cars, most new models come with a Double DIN Head Unit so as to provide touch screen features. Most Double Din Head Units have more pre-amp lines than single din (a simple matter of space) so if you want to install an amplifier for your aftermarket speakers, these are great. For true audiophiles, a Double DIN can provide the extra sound boost that you need to rock out to your favorite station or song. When looking at a new stereo, there are some important factors that you need to consider before making your purchase. To the uninitiated, most car stereos are a lot alike. However, some critical differences can affect how well it will perform in your vehicle. With that in mind, here is what you should be looking at. When talking about usability, what we really mean is how well everything fits your preferences. For example, some people like having physical buttons and knobs to control things like volume and bass, while others may want a more integrated touch screen system. Play around with different stereo setups to find out which control layout is best for you. For anyone who likes to pump up their jam, they will need to find a Head Unit that has a lot of power. Simply put, the more power you have, the better your output will be overall. When comparing different models, you will see two classifications: peak and RMS power. Peak Power is how high the stereo can go in short bursts. If you try to sustain the system at a high level, however, it will eventually damage the speakers. RMS power, on the other hand, is the measure of how much energy your stereo uses on a continual basis. Therefore, don’t judge a Head Unit by its peak power, instead, compare the RMS numbers to figure out which one has more potential. When you install aftermarket speakers, they usually have a higher RMS rating as factory stereos give, and even more than some aftermarket head units. If your head unit RMS isn't too high, consider getting yourself a good 4 channel a﻿﻿﻿﻿mp​ for your speakers and hook it using the pre-amp outputs, which is our next topic. If you’re serious about getting a state-of-the-art speaker system installed into your vehicle, then you will want to pay attention to pre-amp outputs. Pre-amp means the amount of signal you get before it’s been amplified, and the more outputs you have, the more you can customize your listening experience. The way it works is that you can hook up multiple amplifiers (up to three) to your Head Unit, thereby enabling you to adjust the sound as you see fit with different control options. If you’re looking for something simple, however, then you will need just one pre-amp. Because car stereos are so easy to install, that makes them prime targets for thieves. Selling a stereo on the street is much easier than stealing a whole car, and the risk to reward ratio is relatively high. To help minimize your risk of theft, DIN units can come with a partially detachable head. Once you are ready to leave the car, just take the face of the head unit off and save it anywhere (under the seat, trunk, glovebox...) Thieves simply won't take the risk to break into your car to steal 1/2 a car stereo because it has no street value. Since they've got no guaranties that they'll find the other half lying somewhere in the car, they'll pass. Even though you’ve seen some examples of Double DIN Units, you may still have some questions about how they work or what you can expect from them. With that in mind, we have compiled a list of many of the most commonly asked questions regarding Double DIN units, as well as general questions about installing a new stereo into your car. Overall, this process should be quick and simple, and you should have a much better listening experience once you have a new DIN unit in your vehicle. 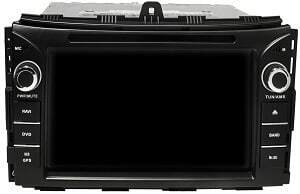 Can I install a Double DIN Unit on any car? If the dashboard has the space for a double unit, then yes. However, if your vehicle had a single DIN unit, then you cannot install something bigger than the space provided. If my steering wheel has audio controls built in, do I need to get a new wheel when I install this unit? No, you do not have to get a new set of steering controls. All you need is an adapter so that your new stereo will connect automatically. For syncing with my phone, what is the difference between an aux input and a USB connection? With an auxiliary cord, you are playing music and audio from your phone’s headphone jack. The sound quality will rely on the phone itself. For USB connection, you can access your phone’s functions through the stereo, making it safer and easier to use. Will a high-powered Double DIN unit be compatible with my current speakers? Yes, it will. Factory speakers are usually really bad and have low RMS rating. Most likely, the new unit will push them to the max. Once you install some of the best car speakers we recommend here, you may need even more power, as most head units rarely produce anything over 25w RMS. Will any Double DIN Head Unit fit into my car’s dashboard if I had one in there before? Because the classification of Double DIN refers to a standard size, all Double DIN Head Units will fit into a space that has held one before. Make and model do not matter in this case. How long can I play video with the engine off? That depends entirely on your car battery. Bigger batteries with higher Ah rates will likely provide longer usage of video-audio features with the engine off (alternator not working). The best car battery for longer use is a deep cycle battery. We review the top 5 double din units on the market to help you find the perfect one. Check our stereo comparisons and our interactive recommendation tool! I have 2 6.5 Rockfords with 45w RMS on my front doors and I want to get a subwoofer on the back. How many pre-amp signals would I need? And which from this units would you recommend? I’ve got like 300 bucks to spend. You can always write me an email at [email protected] and I’ll help you out making a selection for your whole system. Wich doble din stereo es the best to sound quality? I have a Kia Sorento 2010¡! Most Double Din Head Units aren’t really going to fall into the SQ category since they are mostly aimed at providing AV features instead of pure SQ. The things you want to look at when selecting a DD head unit are the EQ features: How many bands of EQ available? Does it have a Time Alignment feature? Adjustable Cutoff Slopes? 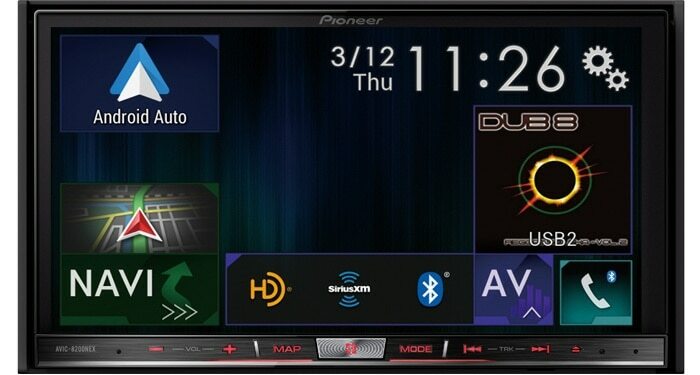 Generally the brands I would stick with are Pioneer and Alpine for DD units. The other important factor is if the HU will be connected to an amp? If so, try to find a deck with higher Pre-out voltage. You want at least a 4 Volt Pre-out connection (It’s where the RCA cables connect to the back of the HU and run to the amp(s). One other option to consider is buying a Single Din HU and putting a plastic cover where the rest of the DD unit would normally occupy. There’s a few companies that make dash kit’s/wiring harnesses for just this purpose. Metra has a good selection, so check them out. If you do decide to go that route, the best pure SQ HU’s are the Pioneer DEH-80PRS and the ultra high end 99PRS. Note that the 99PRS does NOT have an internal amp and MUST be connected to an external amplifier, otherwise no sound will happen. Hope this answers your question. Thanks. This is a great post. I’ve now got a good idea on what to buy 😀 Thank you so much for this roundup.